Editor’s Note: Mike Fairley of show organizer Tarsus Group plc provides a first analysis of some of the new opportunities and solutions to be found at the 2010 show. The label industry has always grown through innovation and new ideas. It’s been quick to encompass materials, technology or products that create new opportunities and value-added solutions, and has been good at solving problems for potential new customers and markets. After the recent global financial crisis, difficult trading conditions and a still somewhat uncertain recovery, it’s probably even more important for the label converter to now be looking at even newer opportunities—both within labels and beyond—and to consider entering new niche markets, becoming more flexible in their production, driving costs down, and increasing profitability. A good a place to start is by attending Labelexpo Americas in Chicago Sept. 14-16. With some 400 exhibitors, 23 conference sessions, a Masterclass and a series of technology workshops, there are a multitude of growth possibilities for converters to study. Among them: Unsupported film, flexible packaging and sleeve-label applications, cartons, digital sheetfed printing of glue-applied labels, RFID insertion, medical applications and booklet finishing. Indeed, in the Stephens Convention Ctr. Hall C, there will be an area solely dedicated to the print and packaging processes beyond labels. Called, amazingly enough, “Beyond Labels—New Opportunities for The Converter,” exhibitors will demonstrate combined packaging solutions and different product and market applications. One highlight: Delta Industrial’s medical-process converting system with in-line heat-seal packaging as well as a complete digital-print finishing line. Meanwhile, Nilpeter will debut the FA-6 press, particularly aimed at the growing number of converters seeking to offer a comprehensive “one-stop” label and packaging service to brand owners and packaging contractors. 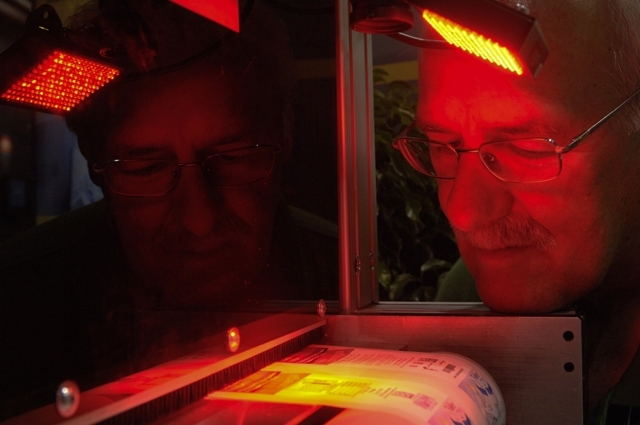 The 8-color, 22-in.-wide press is equipped with both UV-curing units and hot-air dryers for a variety of film packaging, labels, and carton paperboard. Likewise, Mark Andy will aid converters looking opportunities outside p-s labels by showing a number of advanced label and non-label applications, such as the latest in RFID insertion, or machines for the printing of unsupported packaging films and the production of lightweight folding cartons. And what about booklet labels? Want to get into the production of multi-page labels for agrochemical, food or pharmaceutical markets? Prati will show equipment for applying a booklet label onto a base label for automatic application, then add variable-data information as well, if required. Durst Photechnik will showcase a digital varnishing module (DIVA) for the Rotoworx modular finishing system. The system produces different gloss levels in a single pass with a single varnishing fluid. Believed to be unique in the label industry, the module also lets converters produce special effects such as textures and even tactile elements—and even vary the top finish from label to label. My Thoughts: I’ve always looked forward to Labelexpo shows, and this year’s event is no exception. I’ve seen the Rosemont show grow from maybe 200 exhibitors back in 1994 to its doubled-size today, and from a serious “only p-s labels” concentration to 2010’s “every packaging application” tack. It’s a welcome converting-industry trend, especially as a lead-in to the downstream supply chain event of Pack Expo International this November. I hope to see you there. This entry was posted in digital printing, flexible packaging, labels, package printing, paper/paperboard/cartons, printed electronics and tagged converting, flexible packaging, flexography, Labelexpo, labels, packaging, paperboard packaging, printing, sustainability. Bookmark the permalink. 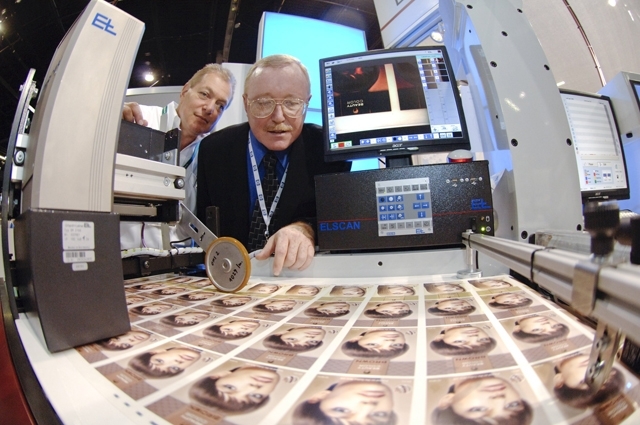 Primera Technology, Inc. (http://www.primeralabel.com) will be showing its new FX1200 Digital Label Finishing System for the first time at a Labelexpo show. FX1200 laminates, digitally die-cuts any size or shape of label, removes waste matrix, slits and rewinds for less than $30,000 — an industry first. Also at the Primera booth will be the CX1200 Digital Label Press. Both machines handle materials up to 8.5 in. (216 mm) wide.